Two very useful and beneficial Mantra Chants for becoming a Poet and an Expert in any chosen field have been described in this post. 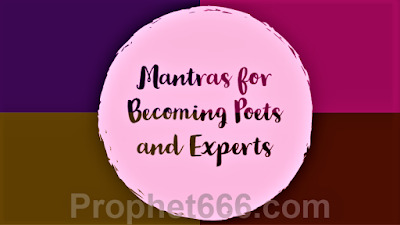 These Mantras, which are very simple and easy to chant are said to enhance the inherent skills of the practitioner who desires to become a renowned poet or an expert in his chosen field or profession. The easy and uncomplicated procedure of chanting these Mantras has been described below in this post. The term poet means a Kavi or a person who composes poems of all kinds, including love songs and Sher-Shayari. The Mantra will work very quickly and effectively in increasing or enhancing the basic shills of the chanter and fulfill his dream of becoming a well-known and celebrated poet. However, as pointed out earlier, the practitioner has to possess certain basic qualities that are normally seen in poets. The Mantra given below has to be chanted 10, 000 times in a predetermined period of time by chanting it for a fixed number of Mantra Chants per day. Any preferred counting rosary can be used to count he number of Mantra Chants. This Mantra is dedicated to the Hindu Goddess of Knowledge Saraswati Devi and even though no special form of worship has been prescribed for the chanting of this Mantra, the practitioner should maintain a Pure or Satvik lifestyle and maintain celibacy, avoid spicy and non-veg food and alcohol during the days of the Mantra Sadhana. He should also not talk ill about anyone and avoid indulging in idle talk and gossip. Hygiene and cleanliness should be strictly maintained during the days of the Mantra Sadhana. This Mantra will be most beneficial in increasing the skills of professionals who desire to become famed and distinguished experts or illustrious scholars in their chosen profession. To give an example, if you are a doctor or a lawyer, the Mantra will enhance and magnify your skills and fulfill your hopes and desires of becoming a famous and distinguished doctor or lawyer. This Mantra given below has to be chanted 108 times every day in order to increase the inherent expertise present in the practitioner. Any preferred Japa Mala can be used for counting the prescribed number of Mantra Chants. This is a Jain Mantra and hence, a Satvik lifestyle is essential for getting success in the Mantra Sadhana. However, no fixed form of worship or Puja-Vidhi has been prescribed for the chanting of this Mantra. Notes – If a woman is chanting any one of the Mantras given above, she has to discontinue the chanting during her monthly cycle. Thank you sir. And i have many other mantras for regular chanting can v make a yantra out of this mantra prayog to gain benefits and save time.